it’s been a week, or maybe a month – Naming a blog is harder than naming a kid. Our landlord wants his house back so we’re hunting for rentals. We’d been looking to buy, too, but can’t find a rental with less than a year’s lease, and can’t buy a house (because of ordinary waiting/processing time of each step) in less than our remaining time at this house, so we’re looking to rent. Again. I am so done with renting. So I’m packing, and house-searching, and trying to keep up with Owen and be a good Mom while Casey job-hunts (bad time to be between jobs) and Audrey is in a super-busy time at work and has little free time. Oh, and because of my rheumatoid arthritis doing a job on my fingers and wrists, I can’t lift more than maybe 5 pounds with one hand, I need another hand, or help, or just not to have a painful shoulder on a slung arm. It’s one hell of a week. 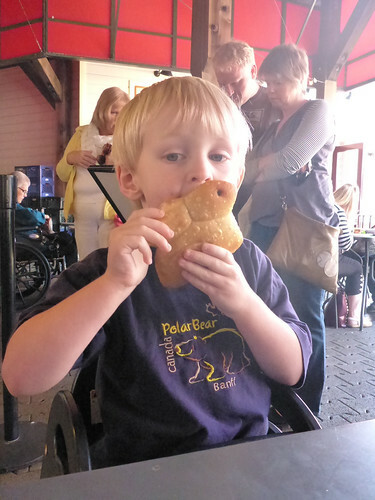 But because that was all about complaining, I’m going to give you a photo of Owen and the bunny bread his beloved Nina gave him when we ate lunch at Boudin Bakery this week. Oh, that’s rough. The travel’s a little tricky, but Morgan and I have some free weekdays in the next little while if there is something that it would be useful for me to come help with, or if you want to meet in the middle somewhere and just blow off some steam.